Together we did it again, and we did it even better. By “we,” I mean all of us: the Dos Gringos team (the grower), many customers (buyers and store-level staff from around the country), and our hybridizer, the scientists we work with to develop cutting-edge seeds and bring to market new and interesting flowers the world has never seen before. 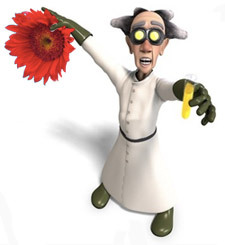 The “it” refers to our annual Sunflower pack trials and tests at Gringo Farms. In a whirlwind week and a half, we were thrilled to host over 40 people at the separate trial farm we created in North Coast San Diego to test new varieties and hold off-site brainstorming sessions with team members and clients alike. We had seeds from hybridizers in the United States, Japan and Israel, and we displayed 20 different beds of Sunflower varieties – everything from natural red and white to bi-colors to lemon Teddy Bears to some of our proprietary commercial varieties. Gringo Farms also has about 50 varieties of perennials from Protea to Safari Sunset, and we use this area as a demonstration garden to teach team members and clients about how the elements we use in bouquets actually grow in the field. The interaction and feedback at this year’s trials were phenomenal! I can’t think of a better way to stay on top of issues, trends and trouble spots than to stand in a garden or sit around a table with those of you on the front lines. The more we all understand the complete cycle, from seed selection to the consumer, the more successful we can be. A big “Thank you” from Dos Gringos to all of its visitors last week. I wish we could have had every single client come through, but we will catch you next time. Until we visit in person, keep letting us know what we can do to help make your flower program crank. 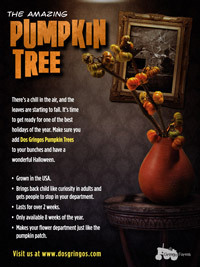 It’s October now, and you’ve got to get your Pumpkin Tree! It is fabulous and in ample supply. It screams autumn – in a good way – and it offers a different twist than the fall standards. You’ll love what it does for bouquets and other arrangements. Our travel schedule is light this month as we settle in and focus on the home front. As always, quality is a huge priority. Mark Young, our Chief Operating Officer, talks in this issue about some of those initiatives. Blocking and tackling are the focus this fall at Dos Gringos. Concentrating on the fundamentals, striving for constant improvement, and building on our core strengths has served us well. This team understands that quality is Priority #1 and that we must be the best in the industry at integrating high customer expectations with the uncertainties and uncontrollable elements Mother Nature throws our way. Daily production meetings and a serious Total Quality Management initiative are helping us. Quality Assurance Manager Mary Luz Rodriguez has made great strides in our production area, and she’s recently expanded her efforts beyond these four walls to include our farms. We believe that long-term, lasting quality is about consistency and a common language that everyone can understand and embrace. Mary Luz and Gabe Gill are driving those efforts here at Dos Gringos. The plant layout is getting some attention this season. As we continue to grow and thrive, we insist on having the best possible flow between assembly and packing so we can deliver the productivity and volume improvements you want. With Thanksgiving around the corner, we’re working on a seven-day work schedule that will ensure you get what you need when you need it. Growers Caveat…Weather permitting of course!